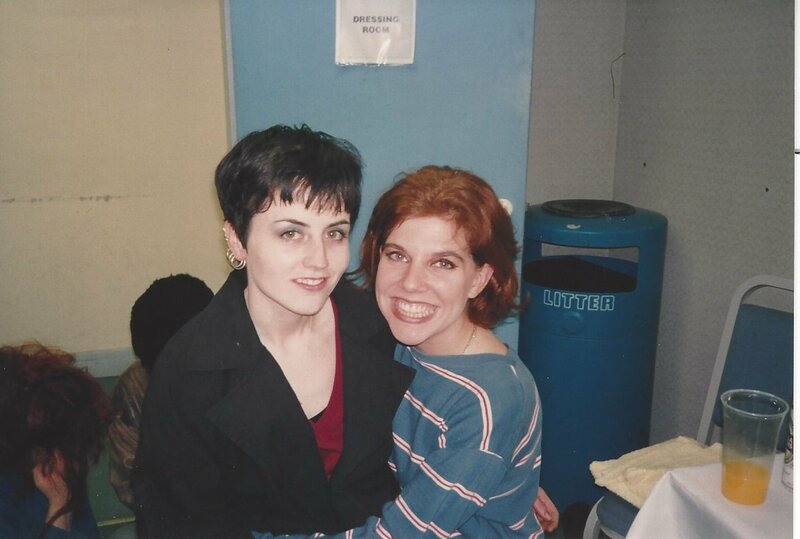 Rare photo posted on Twitter by Miki Berenyi (from the rock band Lush). 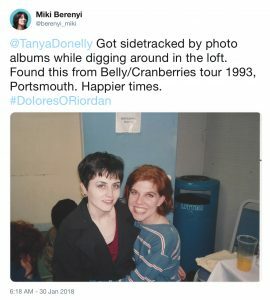 Dolores O’Riordan and Tanya Donelly (frontwoman of the band Belly) during the Belly/Cranberries tour 1993 at Pyramids Centre in Portsmouth on the 23 February 1993. Cranberries fan Alan Martin has published on Twitter a photo showing memorabilia, including a setlist, a newspaper ad and a live audio cassette recorded at The Parkway in 1991. 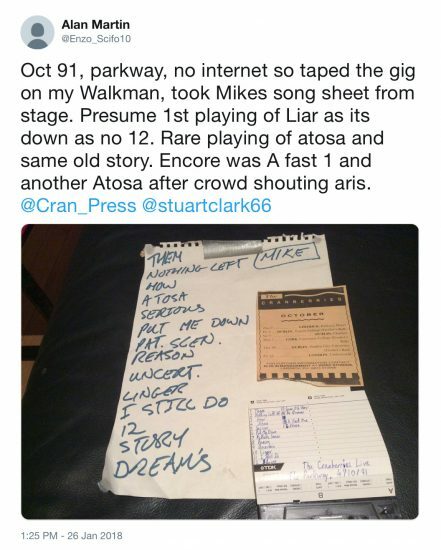 On the setlist, we can read Atosa (Iosa) played two times on that show… and regarding Alan’s tweet, he taped it! So this would be a second and third live recorded version of the song, the first and only one version available until now was recorded at University Of London Union on the 14 November 1991. 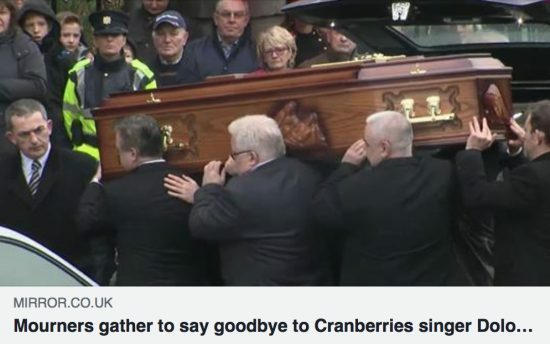 Hundreds of people arrived at Cross’s Funeral Home, Ballyneety, near the star’s Ballybricken home, to pay their respects to the Cranberries lead singer. 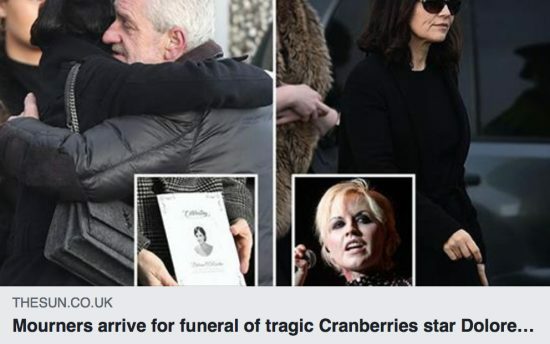 The three remaining members of The Cranberries – Mike and Noel Hogan, and Fergal Lawlor – joined O’Riordan’s mother, Eileen, and her five brothers and sister at the funeral home. The singer’s partner, Ole Koretsky, who also played with O’Riordan in the alt-rock band D.A.R.K., was present. 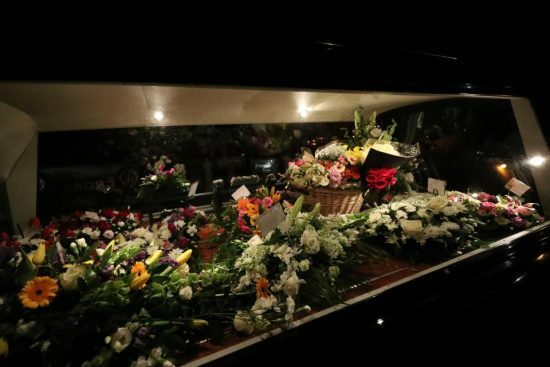 The singer was laid out in an open coffin with rosary beads around her hands, next to photographs of her meeting the late Pope John Paul II and of her performing with her bandmates. Family and close friends of Cranberries frontwoman Dolores O’Riordan accompanied her to her home town church in Co Limerick on Monday night ahead of her funeral. Candles lit the streets as her coffin was brought to the Church of Saint Ailbe in Ballybricken. Two hearses, one carrying her coffin and another carrying floral tributes, arrived at the church shortly before 9.30pm. Among the many wreaths was one from Irish pop group The Corrs. Earlier, hundreds of people had gathered outside Cross’s Funeral Home in Ballyneety where her remains were in repose. 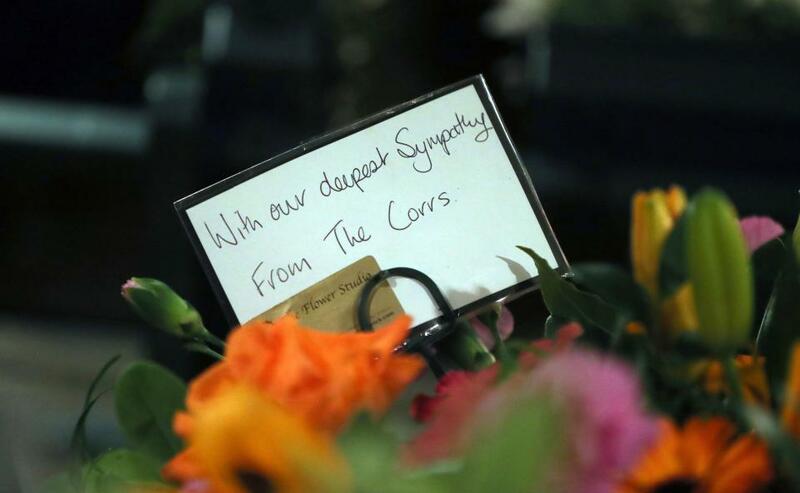 Irish President Michael D Higgins paid his sympathies to the singer’s family and signed a book of condolence. The coffin of The Cranberries singer Dolores O’Riordan is taken into Saint Ailbe’s Church, Ballybricken, ahead of her funeral on Tuesday. After signing one of four books of condolences outside the village funeral home, President Higgins spent fifteen minutes inside privately talking to O’Riordan’s loved ones. 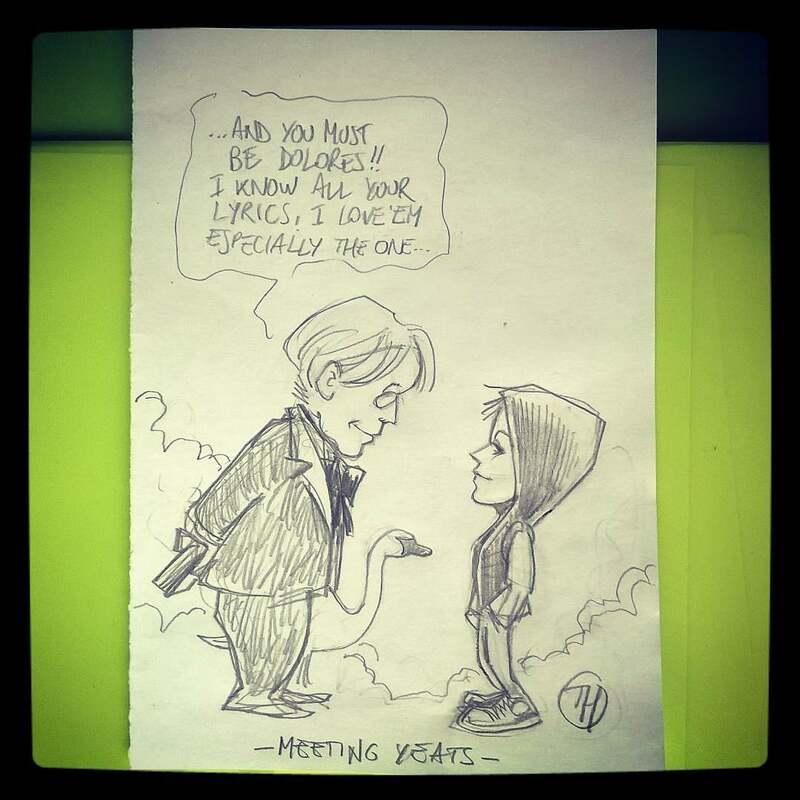 The city of Limerick mourns its favourite daughter. 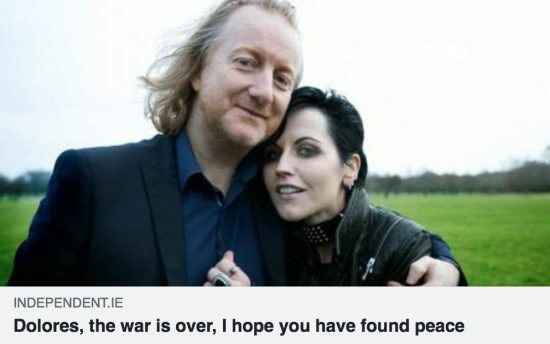 Dolores O'Riordan, Rest In Peace. We’re lacking words to describe what we wish we had never seen. In a tribute normally reserved for Presidents, Popes, and heads of State, O’Riordan’s remains lay in an open coffin in a four-hour public reposing at St Joseph’s Church, in the Treaty City. 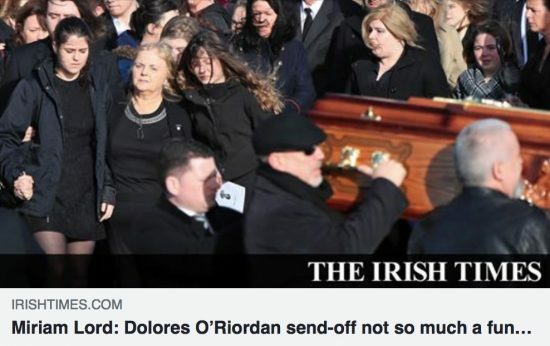 O’Riordan’s mother Eileen and her six siblings accompanied her dark wooden coffin into St Joseph’s Church, which was decorated with white roses, photographs of the deeply religious star performing on stage, and of her two separate meetings with the late Pope John Paul II at the Vatican. 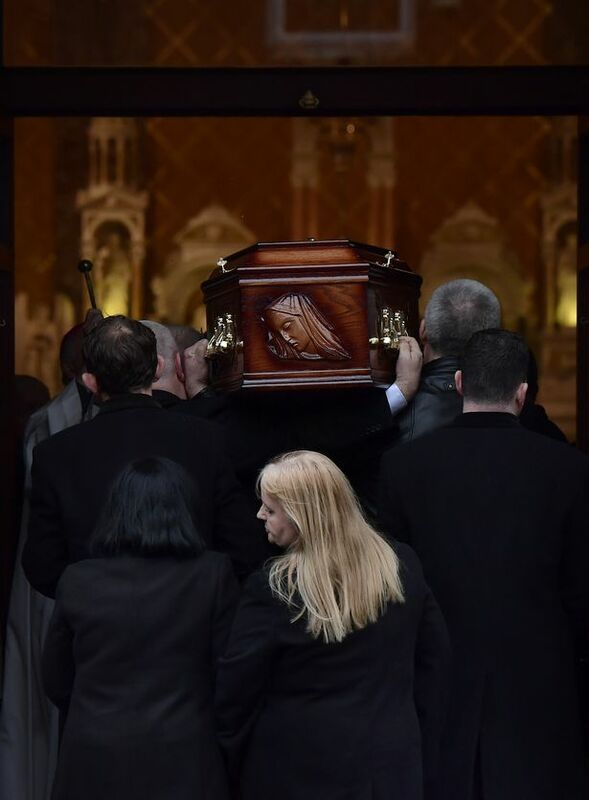 Bishop Leahy said: “In blessing the remains of Dolores O’Riordan here in St. Joseph’s Church in Limerick today, I am conscious that, while millions across the world have been shocked by the sad news of her death, today is Limerick’s public moment to bid farewell. “We come to offer a heartfelt greeting to a deeply loved and cherished daughter of Limerick, a talented representative of the potential of Limerick people and a convinced advocate of living life in truth, love and peace. “As we file pass her coffin, let’s remember God’s love and mercy and pray for her, her family and those she loved and helped in life. 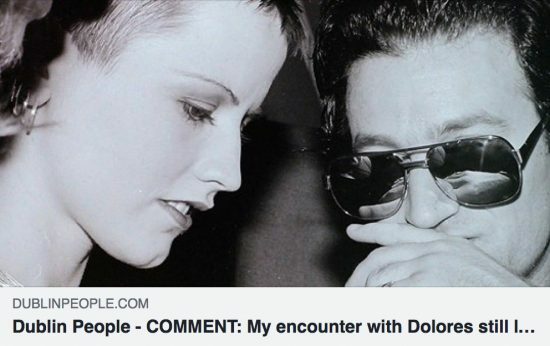 “Dolores appreciated the value of spirituality in our lives. She made her First Communion in this church and was confirmed here. She attended the nearby An Mhodh Scoil (Model School) and Laurel Hill Coláiste FCJ school. Her spiritual journey continued in many parts of our world, and yet Dolores remained anchored in Limerick. We can be grateful to Dolores’ family for choosing this beautiful church as a venue for her lying in repose. Some of the singer’s greatest hits played out in the church while mourners, stood in silence and remembered her in their own personal way. 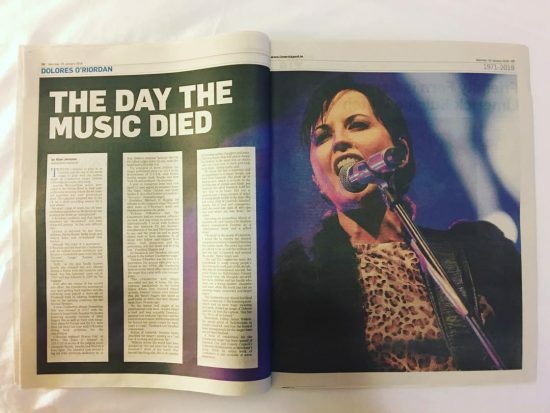 Her voice filled the building, her band’s songs softly playing in the background throughout the service, as a floral tribute beside the open coffin read: “The song has ended, but the memories linger on.” Along the walls, photos of O’Riordan were placed, including one of the singer posing with the Pope. 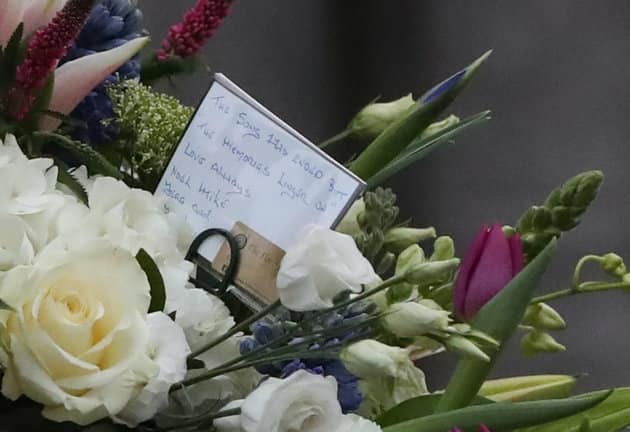 Four books of condolence were also open for mourners to sign. 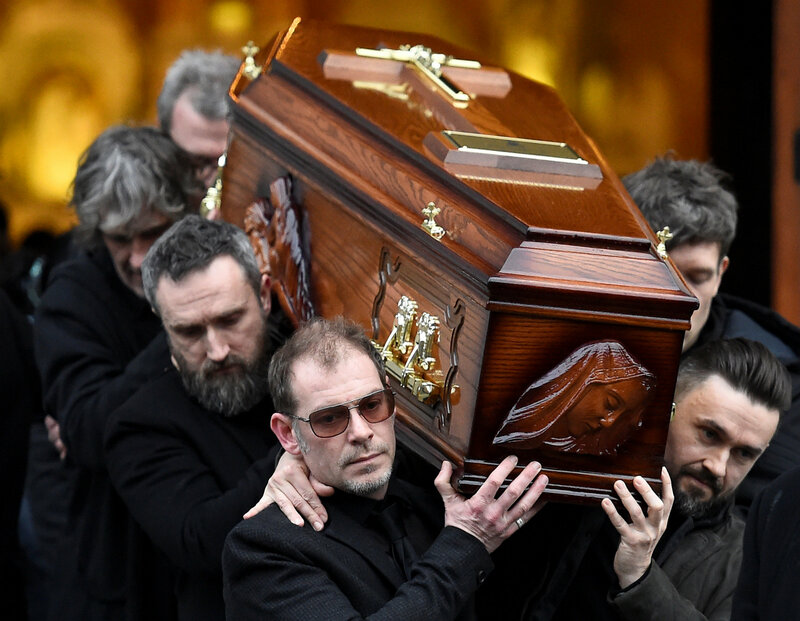 LAID out in an open casket with the motif of Our Lady at the Foot of the Cross carved into the oak at either end, a set of pearl rosary beads are threaded through the fingers of iconic rock star Dolores O’Riordan as she lies in repose at St Joseph’s Church in Limerick city this Sunday. 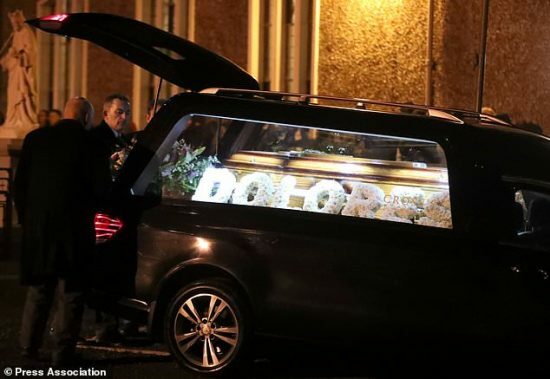 The body of the 46-year-old mother-of-three arrived in a hearse at the church on O’Connell Avenue at 12.10 under grey clouds. “It’s very sad. 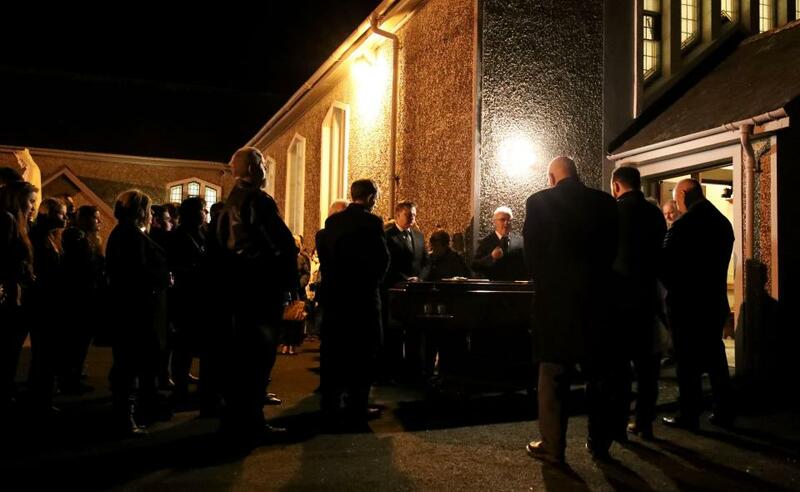 The coffin is open – I’m not sure if people were expecting that and she looks so tiny – very peaceful, at rest,” comments Sheila Deegan, ‎Arts and Culture Officer, ‎Limerick City and County Council, on the steps of the church. Undertakers from Cross’s Funeral Home stand vigil around red ropes which keep mourners a respectful distance from the remains of the global superstar who hailed from the small townland of Ballybricken. 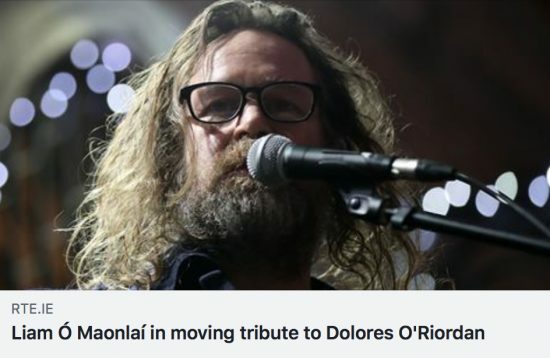 Even death can’t dim the superstar quality of Dolores. A black glittery top peeps out from behind the frills of the casket’s shroud. Dark eyeshadow matches her raven hair. In front of the altar mourners bow their heads. Some say a prayer, some beat their breast, many a tear is shed. Her coffin was carried inside accompanied by her mother and family members. Friends and relatives carried white roses as they entered the Church. At 1pm her mother Eileen and her six siblings left the church after spending an hour with mourners. Mourners said silent prayers in front of the open coffin, with many shedding tears as they said their goodbyes. Others visibly broke down as the left the church. Mourners from all over the world also gathered to pay their respects. 9pm RTE News shows the band carrying the coffin outside the Church, greeted with applause. 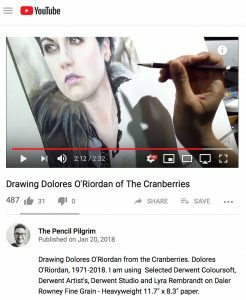 Great tribute to Dolores O’Riordan and The Cranberries posted today on YouTube by user vkgoeswild. “Zombie” performed on piano by Viktoriya Yermolyeva in Paris, France in the hall of the airport Charles de Gaulle. I guess you know why i played this. I got so sad, when i heard this news. R.I.P. 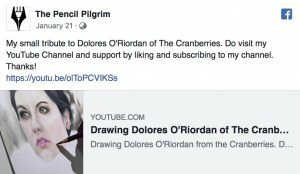 Dolores O’Riordan. After a 18 hours flight and very tired, I found this piano at airport Charles de Gaulle – Paris to play this rendition in remembrance of her.